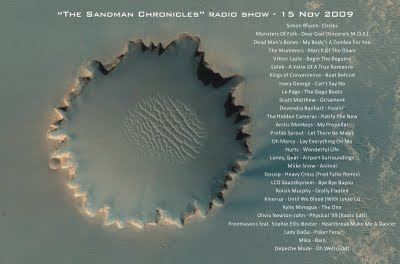 Last Sunday's radio show at Poplie is ready for download for all of you who missed the live one - just check the link on the right side of the blog. And I hope you like this week's background image for the playlist (click on it to see it bigger). Since 2006, NASA's Mars Reconnaissance Orbiter (MRO) has been orbiting Mars, currently circling approximately 300 km (187 mi) above the Martian surface. On board the MRO is HiRISE, the High Resolution Imaging Science Experiment camera, which has been photographing the planet for several years now at resolutions as fine as mere inches per pixel. Photo shows Victoria Crater at Meridiani Planum. πολύ μ' αρέσει η εικόνα που συνέθεσες. όσο για τη μουσική, θα πρέπει να την ακούσω - γιατί τα κομμάτια από τη μέση και κάτω ξέρω μόνο. Ευχαριστώ πολύ! Να ακούσεις και να μου πεις τη γνώμη σου! Και αν θες, στο πλάι έχει και τις παλιότερες εκπομπές (για τις αντίστοιχες playlists δες παλιότερες αναρτήσεις).